I'm not saying that IT departments have a PR problem, but when was the last time you saw a button saying, "Hug an IT person today"? What I am saying is that IT is largely misunderstood outside the walls of the IT environment. And the crusty silos inside of IT can make their own cultural connections tenuous, too. The fact is that IT over the decades has been put into the unenviable role of having to say "No" more often than "Yes." At least that's the perception. IT forms an expensive reality check as businesses seek to reinvent themselves, and sometimes even to adapt quickly in their own markets. Saying "No" it isn't fun, but it's often truth. This is because computers are tangible, complex and logical, and businesses are, well ... dynamic, human-oriented, emotion-driven, creative and crowd-driven. Computers take a long time to set up properly and are best managed centrally, while consensus-oriented businesses change their minds twice a quarter (for better or worse). Yes, the IT guys inhabit the happy-go-lucky no-man's land between the gaping culture chasms of bits and bytes reality versus the bubbly new business models, market inflection points, and charisma-driven leadership visionaries' next big thing. 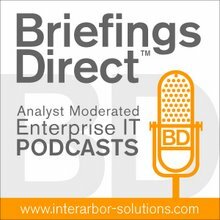 Worse, when asked to explain why "Yes" has to mean "No" to keep the IT systems from crapping out or security holes from opening, the business side of the enterprise usually gets a technical answer from the IT guys (and gals). It's like they are all speaking different languages, coming from different planets, with different cultural references. A recipe for ... well, something short of blissful harmony. Right? Yet, at the same time, today's visionary business workers and managers keep finding "Yes" coming from off of the Web from the likes of Google, Amazon, Microsoft and the SaaS applications providers. The comparison of free or low-cost Web-based wonders does not stack up so well against the traditional IT department restraint. The comparison might be unfair, but it's being made ... a lot. Most disruptively, the social networks like Facebook, LinkedIn and Twitter are saying a lot more than just "Yes" to users -- they're saying, "Let's relate in whole new ways, kids!" The preferred medium of interaction has moved rapidly away from a world of email and static business application interfaces to "rivers" and "walls" of free-flowing information and group-speak insights. Actual work is indeed somehow getting done through friend conversations and chatty affinity groups linked by interests, concerns, proximity and even dynamic business processes. So nowadays, IT has more than an image problem. It has a socialization problem that's not going away any time soon. So why shouldn't IT get social too in order to remain relevant and useful? HP Software has taken notice, and is building out a new yet-unreleased social media approach to how IT does business. It may very well allow to IT to say "Yes" more often. But more importantly socially collaborative IT can relate to itself and its constituents in effective and savvy new ways. 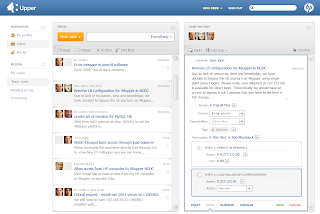 Called 48Upper (apparently named after an HP skunk works location in Cupertino, CA), the new IT-focused collaboration and socialized interfaces approach is being readied for release at some point in mid-2010. There's already a web site stub at www.48upper.com and a YouTube video there that portrays a new cultural identity for IT. I was intrigued by a recent introductory chat with HP's Matt Schvimmer, Senior Director, Marketing and Business Development at 48Upper. He explained that IT people are not reflective of white lab coat stereotypes, that there's a huge opportunity to manage IT better using the tools common now among social networks and SaaS processes. His blog has more. Matt was kind enough to share an early (dare I say, exclusive) look at an in-development (ie alpha) screen shot of 48Upper. It does meld worlds, for sure. IT clearly needs to bridge its internal silos -- such as between development and operations, networks and servers, architects and developers. And, as stated, IT can go a long way to better communicate with the business users and leaders. So why shouldn't a Facebook-like set of applications and services accomplish both at once? HP is not alone in seeing the value of mashups between social media methods and processes with business functions and governance. 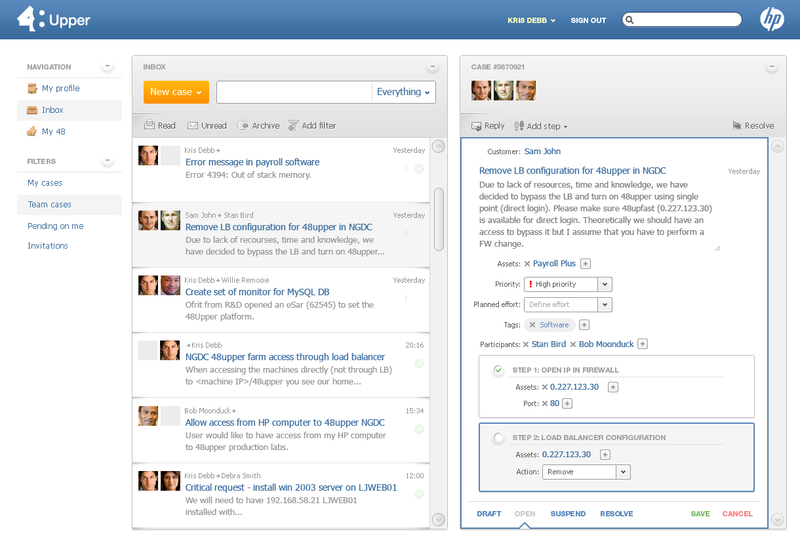 Salesforce.com has brought Chatter to the ERP suite (and beyond). Social business consultancies are springing up. Google Wave is making some of its own. Twitter and Facebook are finding their values extended deeply into the business world, whether sanctioned by IT or not. What jumps out at me from 48Upper is how well social media interfaces and methods align with modern IT architectures and automation advances, such as IT shared services, SOA, cloud computing, and webby app development. A SOA is a great back-end for a social media front-end, so to speak. An ESB is a great fit for a fast-paced, events-driven, policy-directed fabric of processes that is fast yet controlled. In a sense, SOA makes the scale and manageability of socialized business processes possible. The SOA can drive the applications services as well as the interactions as social gatherings. Is it any wonder HP sees an opportunity here? By applying governance to social media activities, the best of the new sharing, and the needs of the IT requirements around access and security control, can co-exist. And -- as all of this social activity managed by a SOA churns along -- a ton of data and inference information is generated, allowing for information management and business intelligence tools to be brought into the mix. That sets up virtuous cycles of adoption refined by data-driven analytics that help shape the next fluid iteration of the business processes (modeled and managed, of course). It allows the best of people-level sharing and innovation to be empowered by IT, and by the IT workers. So perhaps it's time for IT to find a new way of saying, "Yes." Or at least have a vibrant conversation about it.